Really, I can’t imagine what else they saw in me. I was 26, a library school dropout, somewhat brainy but utterly directionless. I had no office skills, I hated computers, and I had to borrow a suit for the interview. I was so self-conscious and fragile that a few years earlier, when called upon to give a poetry reading, I’d burst into tears at the podium and run from the room. At this new job, I soon fell in with the lunchtime card-playing group, a clutch of fellow nerds who’d gotten about halfway through grad school, in French or botany or psychology, before some epiphany or happy accident led them to drop out, train up, and spend their days reading far too much about the interior landscapes of swine. On my second or third day, I made a joke that involved Tinker Bell and Simone de Beauvoir—-and got laughs. I’d found my people. One was a fellow I’ll call Grey. Ten years older than me, he was in that enviable cohort with stories about sit-ins and hitchhikers and, especially, freeform radio. Mired among the artistically unadventurous in my formative years, the 1970s, I loved music, but like many people past college age, I was losing my ability to connect with new (or new-to-me) music. I subscribed to Rolling Stone, but not much grabbed me; I needed to be led. Grey soon became, in effect, the older-brother-with-a-great-record-collection I’d never had. He’d lend me tapes, sometimes of single artists—-Ken Nordine’s Word Jazz, for example—but more often mixtapes. One day, Grey asked if I’d heard the Tom Waits classic “Step Right Up.” I hadn’t, so he lent me a mixtape that included it. (I don’t know where he got these tapes, whether they came from friends or whether he made them for his own amusement. He didn’t make them for me.) “Step Right Up” was genius, kickass, with wordplay the likes of which I hadn’t heard since my mercifully ended suicidal-undergrad-poet days…but I was more curious about two other selections. 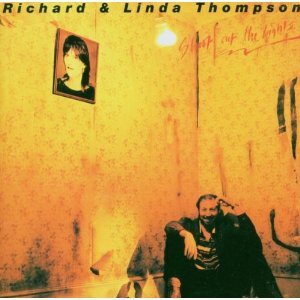 I’d read about Richard and Linda Thompson in one of those many Rolling Stone countdowns of superlative albums. The list contained the expected Springsteen and Beatles and Jimi, but up near the top were these Thompsons, whoever they were. The gulf between their critical acclaim and their album sales—-orders of magnitude lower than those of anyone else on the list—-intrigued my contrary nature. I don’t know why I didn’t chase after them right then; instead, the glowing review and fascinating story of Shoot Out the Lights slipped under the mental file cabinets. I loved “Just the Motion” from the start, but I can’t even quite say I liked “Renege”; I was merely possessed by it. The sound of Richard’s baritone pleading “Ah, noooo” wrapped around and through me, a dusky, spectral hand reshaping some unformed clay into a fully realized figure. I became a woman with a mission. Very soon, I had found one of Richard’s solo albums, Daring Adventures, in the cutout bin at Tower, but Shoot Out the Lights was difficult to get in those pre-Internet days. My husband, after some intrepid research, went to a store nearly an hour away to buy the LP as a Christmas gift. By January, he regretted this gift, as I’d begun playing it daily. At least. I gazed at the lyrics on the inner sleeve, which were printed in appealing puzzlelike patterns as fetchingly enigmatic as the cover, a swirl of amber light in which Linda’s portrait dangled over a sitting, slumped, shade-faced Richard like a judgment both deadly and desired. I studied the liner notes. Once too shy to sing even in front of my husband, I let my voice travel the harmonies, first clandestinely, later—-years later—-with abandon. I guess you’d call the music “folk-rock”; to me, it had no genre. The critics, who, along with the Thompsons’ “cult following” (may I send you our newsletter? ), are the ones who claim to know best, will tell you that the songs—-all conceived by Richard, with Linda’s input on “Did She Jump or Was She Pushed”—-blend rockabilly and Middle Eastern and Celtic styles, among others. I heard sounds both bone-familiar and plain odd. What mattered, what matters, so deeply to me in this music? Was it my Scottish ancestry, my hillbilly heritage? Was it some musical madeleine from 1967: my father singing “My Wild Irish Rose” as he made a bologna sandwich? Was it my familiarity with watching the dark? Or did I, in my unsettled twenties, just need a good musical kick upside the head? “Just the Motion” ends side one; flip the disc, and the title track smacks that placid sonic ocean with the force of a mortar. Shoot Out the Lights is very “sided”; one is supposed to feel that electric explosion halfway through. I should mention here that, in early listenings, I didn’t really notice the guitar all that much. (Our old pals the critics will tell you that’s what you’re supposed to admire about Richard Thompson.) I enjoyed the rubber-bandy bend and sting of the solos in “Shoot Out the Lights,” and especially the market stall’s worth of instruments, headed by that guitar, in the engaging coda of “Back Street Slide.” But I was in it for something else, something tonal, most of which was carried in Richard Thompson’s turns of verbal phrase and in his voice. Each song—-and there are only eight—-is a world, carrying its own atmosphere, gravity, terrain. “Did She Jump or Was She Pushed?” is especially distinctive, with its sinister lyrics (“Lying in a pool of herself with a twisted neck”) and its billowing curtains of sorrow in the instrumental passages. Was it, or was it not, written about Richard’s bandmate in the groundbreaking Britfolk band Fairport Convention, the late Sandy Denny? Grey guessed it was, but then again, Grey had told me not to bother to buy Shoot Out the Lights, as his tape contained the only two tracks worth hearing. How could he not have been swept up by “Wall of Death,” the anthemic closer, with its fairground imagery, its brave harmonies, and its hard-to-parse lyric “This is the nearest to being alive”? Finding my editing job, my friends there, and the music of the Thompsons both centered me and set me flying. I learned to drive. I took up black coffee and dark beer. I joined the Internet in 1993 to be part of a “Richard Thompson discussion list,” which is worthy of a lengthy essay of its own. At a folk concert, I saw a flyer for a magazine called Dirty Linen, which was named for a Fairport Convention song and covered the sorts of music I was finding I liked. I volunteered to write music reviews for the magazine. Ultimately, I parlayed these reviews into paid freelance work. I began attending Richard’s concerts all over the world, a great adventure for someone whose family seldom traveled beyond the Beltway. (I’m currently holding tickets for shows in Virginia, New Hampshire, Maine, New York, and Pennsylvania and a weeklong music cruise in the Caribbean.) When Linda came out of retirement to tour, I got to hear her a few times; back in 1988, I’d thought I’d missed that chance. As a Thompson fan, I learned about Scottish polka, surreptitious concert recording, morris dance, Sufism, vocal disorders, proper English tea (milk in first! ), the moral complexity of marital discord, and the worth of standing in line for three or four hours or more, with my tribe, to gain a spot half-sprawled over the stage monitor at the foot of the 9:30 Club stage. I left my editing job in 1997 to devote my time to writing. I spent several years on what was to be the first biography of Sandy Denny. Richard Thompson (a very, very good sport) wrote my foreword. The project fell apart rather dramatically, as did I, almost simultaneously. I pulled myself together and kept writing reviews for a few more years but ultimately realized that the work was neither my bliss nor my meal ticket. So I took my writing back in the direction of poetry, and I took my need for gainful employment back to the same job I had in 1987, in the same place, with many of the same people. Grey’s still here. He’s tried to hook me on Leonard Cohen. Brilliant dude, but there will never be another Richard Thompson for me. That “Ah, noooo” is in my blood. I don’t know how it got there; I feel like it was always there, like some virus or other occult phenomenon, waiting for a chance encounter to wake it up. Pamela Murray Winters grew up in Takoma Park, Maryland, and now lives in nearby Silver Spring, walking distance from a soon-to-be-opened music venue and a noted poetry series, right in the happy middle. 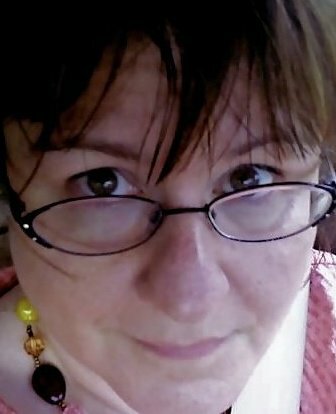 Her poetry has been published or will soon be published in Gargoyle, Gettysburg Review, Delaware Poetry Review, Fledgling Rag, Innisfree Poetry Journal, Anatomy & Etymology, JMWW, Calvert Review, and Takoma Park Writers 1981. She is at work on a book of poems about the transaction between performer and audience. She sometimes posts daily poems at oncedailyasdirected.blogspot.com.